What with all the distressing news reports of flooding, I got thinking about how the location of floods unsurprisingly co-inciding with old streams long forgotten by most - esp housing developers. Heres one to start with which I THINK is still officially called the Ballinclea Stream - but if anyone knows better feel free . . . .
any other forgotten streams out there? Just found a related Topic "O'Tooles Stream" under "Lighthouse" Forum. Very interesting and thorough discussion on what is a different stream (via Glasthule) but it also gives 'Ballinclea" stream a different name "Micky Briens Stream". I'd dearly love to know how it got that title or what it was known by in the various localities in passed through. Apart from any social memories that these streams give rise too, they have important political and financial implications because they often define land, urban, ward, & baronial boundaries. And you can be sure your friendly Home Insurance company has a detailed map and charges accordingly. Hi Micheal ! I was born and reared on Ballinclea Road and knew that part of the stream well. Ballinclea Road when I was growing up was more a country road than anything else, the stream as you correctly said started up where Ballinclea Heights are now, near where the resevoir is was a mini lake with an island in the centre, great place for wild fowl, the stream flowed out of that down towards the golf course and ran down alongside the course from the 2nd tee towards the road where it went under the road into Belton's farm and on the way you posted. That section of the stream I felt was "mine" because I was up there almost everyday with my dogs, it was a wonderful area, it was also a very good business place for me !! The golfers used to drive from the 3rd tee towards the woods and the stream and the vast majority of them over hit their shots, so after school I would go up and dam the stream ,then go up to the bend and dredge it with my feet and collect the golf balls, then down to Willie Gaffney who was the pro and get 2d each !! I also have to confess that I had an excellent dog, we used to hide in the bushes at another hole at the Mullin's Hill side which was out of view of the men driving off, yes, shamed to say the dog had 4 balls collected before the lads came over the horizon !!! As you mentioned floods, a new house was built almost over the stream which was put into a pipe to facilitate the building, my Dad used to say it was tempting fate to build over a watercourse as nature would win at some stage, he was proved correct when years later during a very wet spell the water came up and flooded the house, the name of the house was Wyvern. I could go for hours about my neighbours who were all English and Scottish and were without exception " characters " and quite eccentric, everyday was an event !!! Don't know much about the stream after it left Belton's and really hope you get a good response for it's onward journey. It'll be interesting to see how many peoples lives were touched by this waterway. There must be some mighty stories (like your own) out there. "The existence of the historically important "Mickey Brien’s Stream" should be sign-posted as the stream that afforded the foundation of the monastery at Carrickbrennan (and later Monkstown). The County Council should initiate a study into this history of this important stream and its name. Remember, to the casual visitor to the County little or none of our waterways with the exception of the Shanganagh River at Loughlinstown, is marked by signage." The section that enters present day CBC Monkstown is close to the back of Carrickbrennan Graveyard and old maps show a weir there. Good posts Michael. I'll be posting soon but I want to scan some stuff for you first. Ref Ballinaclea Stream, as childern in the mid to late 1950s I have vivid memories of BLOCKING and Damming the stream as it flowed through Mounttown, Long before Mountwood was built. It was then a large field with the Lucan Dairies Horse paddock at the south end..The stream had flowed from 'Mackers Swamp' (now Fitzgerald Pk) into the field at Dunedin Tce/St Pats Crescent...The shock on our very young faces when one fine day a fleet of Thomas McInerney Lorries and plant appeared, fenced the place off in preparation to build what became Mountwood flats. Another big bit of our childhood stolen FOREVER...Somehow the damming at Wheelers Castle swamp was never quite an exchange !!! Last edited by Enviro500 on Thu Oct 27, 2011 11:54 am, edited 1 time in total. This Stream way back used to form a pretty big marshy pond on D/L Golf Course behind St Joseph's national school. It was right beside the first green and like Keeper, a lot of Golf balls would end up in it and we would dredge it with an old rake to find them. Also, and yes, very bold I know but the green was slightly around to the left from the tee-off and obscured by bushes which we would hide in and when the balls came down we would run out and grab them and hide again. Then the Golfers would come down scratching their heads wondering where the balls had gone to and nearly always assumed that they had ended up in the pond. When we had enough over days or whatever, we would go around to the Club and sell them back. Sorry if you were ever one of those Golfers. SOURCE: "The Book of Dun Laoghaire" John O Sullivan and Seamus Cannon. Very interesting articles about the local streams and their sources and routes. My mother,s back garden backed onto the 14th or 15th green of Dun Laoghaire golf course and in times of heavy rain the whole area became a pond on which you could row a boat (if you had a boat). Of course that would be the lowest part of the golf course so maybe it was natural to end up flooded occasionally. Presumably for monetary reasons no building work has commenced on that side (clubhouse) of the course but it will be interesting if things pick up again to see if there will be buildings there. I dont think you can move a natural floodplain and even if you can you,re only pushing the problem onto someone else. That's brilliant info about the streams Strum, yes, looking at the Golfers looking for their golf ball was very funny, they never seemed to be able to twig something was wrong when ALL the balls went missing, you could understand maybe one lost, but 4 together, impossible, would the book be still available ? keeper wrote: would the book be still available ? No idea Keeper but you can borrow this one if you like. Good reading on all aspects of the area. Thanks Strum ! will check first and if all fails I'll take you up on your kind offer. keeper wrote: Thanks Strum ! will check first and if all fails I'll take you up on your kind offer. Mickey Brien hasnt gone away you know! Came across this contemporary video on "Packenham Stream"
I have a great book "Hidden streams" by Brian MacAongusa, a local historian. He has put a lifetimes work into this book and to my shame I don't read it enough. The blurb says "By tracing the significance of rivers and streams in the lives of the first prehistoric inhabitants, the early Christians, the Vikings and Anglo-Normans, this book throws a new light on many of the monuments and landscape features that are still visible today." The author is a joy to meet.He loves every stick and stone of DunLaoghaire. At one time we asked him about the huge amount of ants in a friend's garden at Shanganagh, of course he said the Irish meaning for Shanganagh is "full of ants". We never knew that. Jordo has recommended that book on a couple of occasions. Keep meaning to look for it. Strum wrote: This Stream way back used to form a pretty big marshy pond on D/L Golf Course behind St Joseph's national school. It was right beside the first green and like Keeper, a lot of Golf balls would end up in it and we would dredge it with an old rake to find them. Reflecting on our debate about where exactly the Ballinclea Stream joins the Monkstown stream, Ive come across some evidence that strongly favours your view that Ballinclea flows into the upper end of Packenham Road. The OS maps appear to show "Mickey Brien's keeping to the left of the CBC playing fields - running along the rere of Carrickbrennan Road properties and along the boundary of Uplands. If it got that far, it would be impossible for it to flow over the Hill to 'my' route underneath the Old CBC tennis courts (behind Monkstown Hospital). It's still possible that it entered Packenham at the "Friends" end but didn't join The Monkstown stream until lower down (at the Grovenor junction). That said, Id be very reluctant to dispute your excellent knowledge of the area. Its entirely conceivable that 'my' river that I thought ran behind the Packenham houses was a service drain that ran towards the Friends MH. I'll continue to trawl the maps. And I thought Gulliver was wrong too...silly me!! I've had a look too, since our walk. Firstly, there are various types of manholes. The manholes which cover sewage systems are fully closed types for obvious reasons. The manholes which cover clear water are slotted types, and one can hear the moving water below. With a good torch, I suspect that one could actually see the water. On Pakenham road there are three slotted manholes which particularly attract attention. There is the middle one one which we looked at about 40 yards east of the Friends Meeting Hall, in the centre of the road at the junction of Pakenham Road and The Hill. It is my belief that this is Mickey Brien's Stream which has come down the backs of the gardens on Carrickbrennan Road and disappears underground just behind house no 9 (See OSI map http://maps.osi.ie/publicviewer/#V1,723292,728502,7,10). On the map it is shown as moving directly towards this manhole, about 50 yards away. The second interesting slotted manhole is at the junction of Grosvenor Terrace/Pakenham Road/The Hill i.e. a further couple of hundred yards east along Pakenham Road. This manhole is more noisy than the previous one. However, I think that is only because there is a slight downward slope on Pakenham Road, and so the manhole is less deep - the water is closer to the top. So, to sum up, myself and Miceál differ in many respects with regard to the location of both rivers at these points. My contention, until proven otherwise is that the Monkstown Valley stream runs the full length of Pakenham Road through all 3 above manholes, and is joined by Mickey Briens stream at the manhole just beyond the sign about the famine kitchen. This is not to disagree with Gulliver ( I wouldn't dare) but to clarify one historical point. I suspect this was before the substantial widening of Carrickbrennan Road ( late 1960's?) Its entirely possible that, as part of those Roadworks, the Stream was diverted right - along Carrickbrennan Road towards the junction with Packenham before swinging left - towards the junction with The Hill where it got joined with my beloved Mickey Brien's. Thus abandoning the old Monkstown riverbed that ran (allegedly) behind west side Packenham houses. Earlier today, I did some further investigation. On the route of Mickey Brien's Stream, I found that there is an additional slotted manhole on The Hill and it happens to be directly in line with the fence between Uplands and No 9, Pakenham Road, indicating that the stream flows under the road on The Hill for about 30 yards. I followed the Monkstown Valley Stream along under the bridge at Alma Park, then behind the Parish Centre, through the PP's garden, to the point where it disappeared under the carpark of Carrig House. The water level is low and the smell is not great. There are a few resident ducks (wild but very tame) there. I'll check with the guy in charge of the Friends Meeting House about the state of any riverbed behind the Meeting House or in his garden next door. The 2 of ye will be arrested for suspicious behaviour walking up and down the middle of the road listening to manholes. Navanman wrote: The 2 of ye will be arrested for suspicious behaviour walking up and down the middle of the road listening to manholes. am going to suggest "Pooh Sticks" - then we could stand at the manholes and watch them go by. But as regards the historical route, here's something I uncovered from my "underground source". Those slotted manholes are not evidence of a stormwater channel. In fact they cover a mixed storm/foul water sewer that still runs along the full length of Packenham, passing the Top Hat (C) and entering the sea at the "Gut". I assume the new pumphouse now intercepts it. Stand over any of those manholes and your nose will confirm this. The Monkstown Stream enter the sea further west on Salthill Beach - just behind the wall - you can see the outlet pipe (in the picture) at low tide. 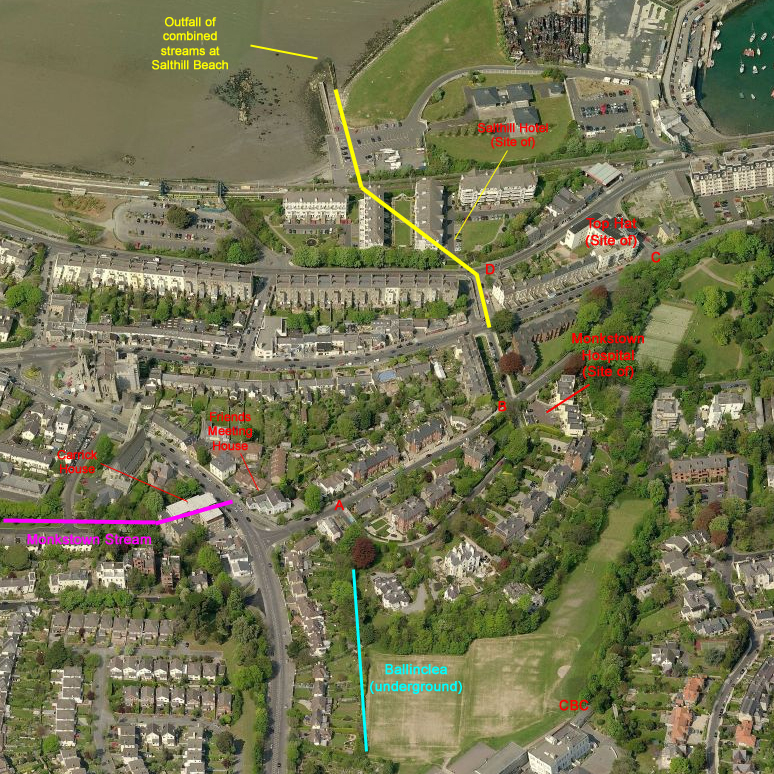 And my source believes it travels along Grovenor Terrace, across the Crescent & down that little link road opposite (D), under the Salthill site. I have no compelling information yet on how exactly it joins up with its Carrick House section.